At the GBC Golf Academy at The Okanagan Golf Club in Kelowna, we offer a variety of instruction programs for every player of any skill level at our double-ended driving range and private lesson area. Contact us to assist you with choosing the right program for you, whether it's a private lesson or a golf clinic. Private Coaching will give you a chance to work one-on-one with one of our trained instructors who are great for golfers of all abilities. Lessons are 45 minutes in length and will be tailored to your needs, and are booked to work with your schedule. 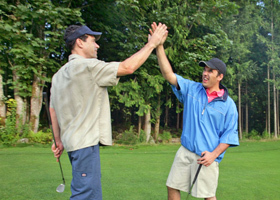 Group lessons are a great way to learn all aspects of the game with your friends in a fun and relaxing atmosphere. Group lessons include 4, 1-hour sessions tailored to your group's needs and schedules.